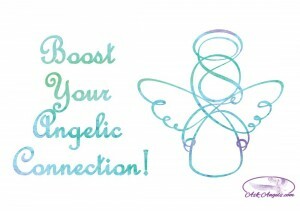 Boost Your Angelic Connection to Receive Clear Guidance From Your Angels! Your angels are always with you, and the truth of the matter is that you’re always connected to them… But this doesn’t automatically mean you’ll notice their guidance and presence. Societal conditioning, layers of belief, and a highly efficient (at keeping you feeling separate) ego mind may have you completely missing your connection with angels. But the good news is, you can change this, and if you ask them to, your angels will actually help you to tune into the frequency and notice their presence. Angels are high vibrational spiritual beings, and so while they are always near and willing to help you, you have to tune into their wavelength to notice them. I’ve always liked the radio analogy… There’s a classical music station that’s always broadcasting, but unless you’re dialed into that frequency, you’ll completely miss it. If this is at all what you’ve been feeling like, here are some tips to help you dial into the frequency of angels, so you can develop and boost your angelic connection. Not feeling connected at all yet? Start with the 7 Steps for Making the Initial Connection here. You can absolutely get to the point where you’re connecting with angelic guidance on the go, and feeling the presence of your angels at all times. But to start… Set aside some time to consciously tune in to your angels. Find a comfortable and quite place where you can take a few minutes to connect with your angels. Turn off your computer, silence your phone, close the door and put up a “do not disturb” sign if you need to… Set the intention to connect with your angels. Let’s face it, life can get busy, cluttered, and a bit hectic feeling… And if you’re anything like me, so can your house! 😉 This isn’t a problem, but when you’re just learning to tune into the guidance and presence of your angels it can be really distracting. Before consciously tuning into the guidance of your angels, take a few minutes to tidy up your space. Take out the trash, put stuff away, and eliminate clutter. This really goes hand in hand with clearing your space. Angels are incredibly high vibrational, light and pure spiritual beings. For you to dial into their frequency, you need to raise your vibration too! The good news here is that your angels are happy to help you with this. Ask your angels to cleanse and uplift your vibration. Simple right!? Then just take a moment to sit in a relaxed position, breathe, and imagine Divine white light all around you. Consciously breathe in the light, and when you exhale let go of anything weighing you down. Listening to some uplifting music or putting on a guided angel meditation is a beautiful addition to this process. Frankincense, peppermint, and lavender essential oils are wonderfully supportive in this process as well. Put a few drops of oil on your hands, and enjoy the smell to uplift your energy and center you in the present moment. Believe it or not fear is one of the main things which blocks people from a profound angelic connection. A simple remedy for this is to start with some sort of protection ritual that helps you to feel safe and secure. For me, invoking Divine light does this perfectly. You can also call on Archangel Michael, Jesus, or the angels of protection to watch over you while you connect with your angels. Ask for Your Angels to Connect With You! I mentioned above that your angels will actually help you to boost your connection with them… But you have to ask for them to do this! Take a deep breath, close your eyes, and do your best to focus within. When you ask… Your angels will answer. Don’t try to hard to listen, just focus on your breathing, and trust that your angels are responding to your call. Quiet your mind, open your heart, and listen for the guidance from your angels. Keep in mind you may hear angels a bit differently than you would expect. Pay attention to inspiring thoughts, feelings, and sensations that appear in your inner space and then trust, or write down the guidance that appears. Sometimes the most important guidance you can tune into will come through your feelings and spirit rather than through your mind. Remember that your angels are incredibly high vibrational spiritual beings who vibrate with pure love and light at all times. Any guidance they share flows through from this perspective of love and light. If you’re getting any fear based messages or feelings, let them go, this is not your angels! Release any fear, doubt or other interference from your ego mind into the light and refocus on your breathing, tuning into the Divine light that is all around you, and listening with an open heart for the guidance of angels, which is 100% in alignment with Divine Love. If you’re really having trouble pausing the voice of doubt from your ego… Ask your angels to help you let go of thought, and more fully tune into the love and angelic frequency present in this moment now. Your angels are with you! Practice, keep it simple and follow the tips above to boost your angelic connection and receive clear insight and guidance from the angelic realm. If you’d like further support, or a guided meditation that walks you through the process of connecting, check out the How to Receive Angelic Guidance Angel Course Here! Hey Melanie very nice article ! Great help for those who are at an early stage , good ! Thanku !! Thank you so much Melanie <3 !! Melanie , my name is Robert Knaus and I am subscribed to receive your emails , they help but I’m having problems. I went thru a tough time losing both my parents and battling drugs. I’ve been clean for bout 2 months and have an awesome job now, but I have a gift I’ve come to acknowledge. It’s kinda strange but I’m open to it but really need help on how to know and make sure it’s really my angels. More or less to get to the point I hear spirit voices, but can’t make em out very well, I sense them, I feel vibrations in my feet, and I’ve also seen pure energy moving around several times. I’m just worried something is tryn to feed off my energy and I could really use some sort of angel channeler or channeled message from a legitimate source. Is there anyway you can help me at alo. Please and thank you , with much love.